One of the most significant counter-forces to modernism in the history of design, Ettore Sottsass made monumental artistic contributions to every decade since 1945. His career produced a provocative body of work, including architecture, furniture, industrial design, glass, ceramics, painting, photography and a wealth of writings. With this work he intellectually and aesthetically challenged the conventional wisdom of forms and proportions for over 65 years. 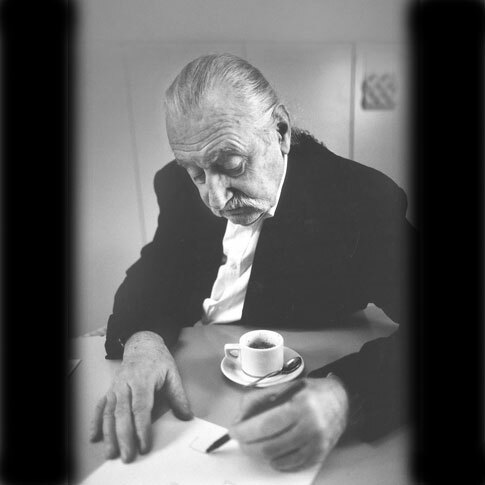 Sottsass was continually driven by a personal search for a new language of modern design. His rigorous pursuits led to the creation of work lead by the pursuit of radical design, anti-design, post- modernist architecture, and the founding of Memphis in the early 1980s. Sottsass' career produced a diverse array of commissions that transformed architecture and design. Iconic built architectural works include Wolf House in Colorado and Milan's Malpensa Airport completed in 2000. He designed for Alessi, Olivetti and most recently Serralunga. He died in 2007.